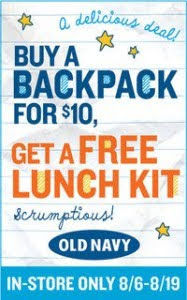 The Chipper Clipper: Buy a backpack for $10 get free lunch kit @ Old Navy! Buy a backpack for $10 get free lunch kit @ Old Navy! Old Navy is one of my favorite stores! This is a sweet deal! I just wish I could use this deal! My little man is starting preschool this year! Buy a backpack at Old Navy for $10 (reg. $14.50-$19.50), and you'll receive a FREE Lunch Kit! After you stop over at Facebook and RSVP for this even find The Chipper Clipper and "LIKE" us to get all the up to date deals delivered to your live feed! 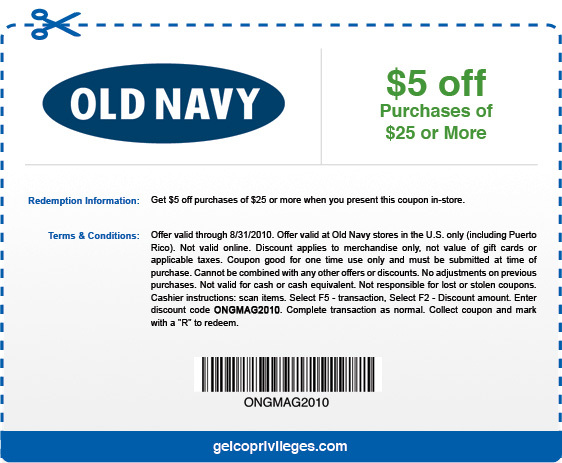 Save even more when you print this $5/$25 Old Navy coupon which is good through August 31, 2010. This weekend save big on all super styles of Old Navy adult jeans. Get 25% off looks for him including Loose and 25% off for you on cuts including Rockstar, Diva, Dreamer and Flirt. Don’t miss your chance to add a few more of your favorites to your closet. But remember, this fab 25% off adult denim deal is good Friday to Sunday, 8/26-8/29.